1. 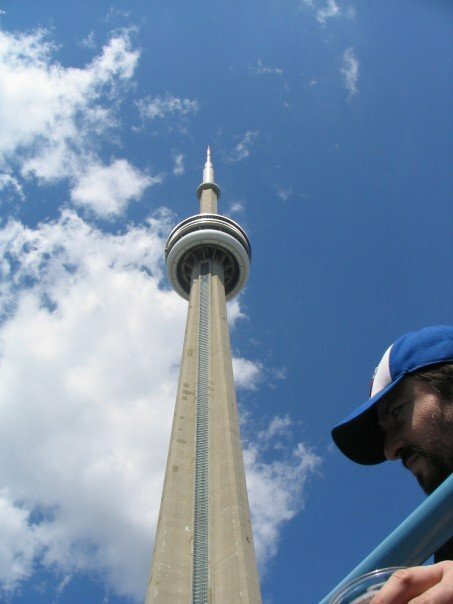 Affordable baseball at Rogers Centre– You could shell out a cool hundred or two for tickets to Fenway Park or Yankee Stadium or see the other sometimes first place team in the American League East Division. The Toronto Blue Jays play 18 home games against the Red Sox and Yankees (May -September) and a 500 level ticket, Keith’s beer and ballpark dog total about $25. Buy your dog at one of many stands outside the ballpark for $3, rather than at the concession stands for $7. Throw a loonie ($1) or toonie ($2) in the hat of the chanting “Let’s Go Blue Jays!” solo-drummer, who is unmistakable in Jays uniform outside the park before every game. 2. Toronto Islands (Ward’s Island)– Just a 20 minute ferry-ride ($6.50 return) from Harbourfront, this otherworldly Toronto hangout has not the stress, or frenzied pace of the mainland. Propped with an inverted panorama of the city skyline, south of downtown, Ward’s is the ideal location for afternoon escape, bike riding through automobile-free neighbourhoods, suntanning like a seal, or playing the 18-hole Frisbee-golf course. A local islander has been known to sell used “discs” for reasonable prices. 3. The Brickworks– In the Don Valley, down the Moore Park Ravine from Chorley Park, lies the old Toronto Brickworks building with a natural regeneration project taking root in place of the outlived brickyard. A series of connected pathways weave around bull rushes and leafy ponds hosting mysterious creatures. A climbable 100 foot ridge skirting the park provides an expansive view of the valley and skyline. 4. 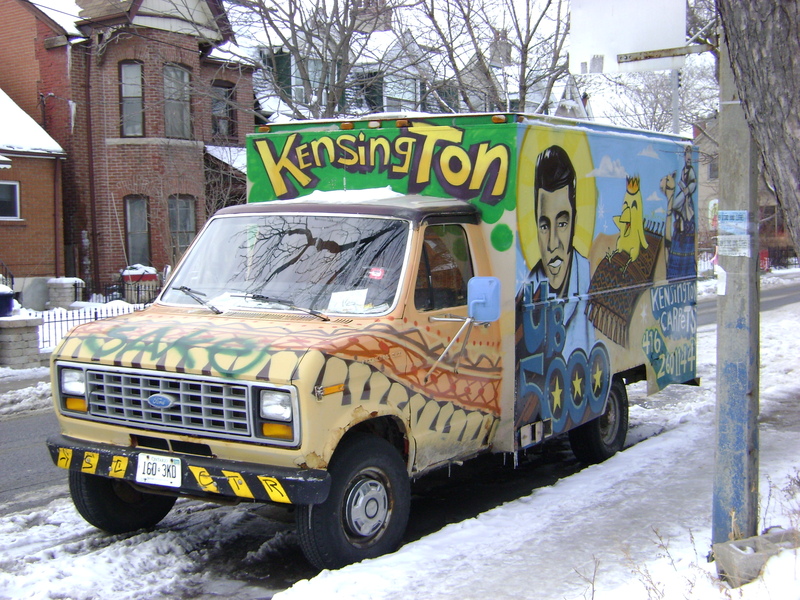 Kensington Market– The epicenter of Toronto multiculturalism, with Mexican, Caribbean, French, Lebanese and Chinese food sites and smells, conjures images of back-packing another continent. Try on live roots, blues, jazz, or indie sounds, after browsing the racks of suede jackets and tickle trunk treasures of vintage clothing shops. 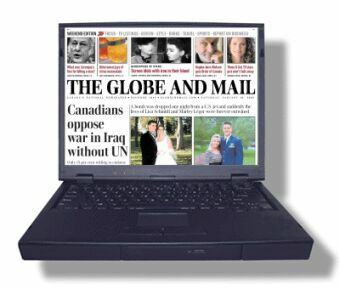 Get your hands on a rare book, or your favourite publication at Not Your Rosedale Library. Grab a Jamaican patty from a Chinese-owned butcher-shop, or have your choice of vegetarian restaurants. 5. Grossman’s Tavern– In downtown little China (spadina), this Toronto institution serves up dirty draft and presents live blues, jazz and blue grass 365 days of the year. At this local haunt of late great Canadian guitar impresario Jeff Healey, be sure not to talk too loudly during live sets. The regulars take their music seriously here. 6. High Park– With tennis courts, soccer fields, baseball diamonds, running trails and a fitness circuit, physical activity is all around you. High Park has ample forested area, a pedestrian train and fishing pond. Order the $5 breakfast at Grenadier Restaurant shrouded in cherry blossoms. Return from your athletic sojourn for patio pints. Visit bison, llamas, peacocks, deer, highland cattle and sheep at the zoo. 7. Bloor Cinema– Specializing in cult classics, independent films and cheap Tuesdays, this “movie house” is the antithesis of the Paramount. Recent highlights include: a documentary about the paper-rock-scissors phenomenon, horror movie nights and a screening of the Obama inauguration. 8. 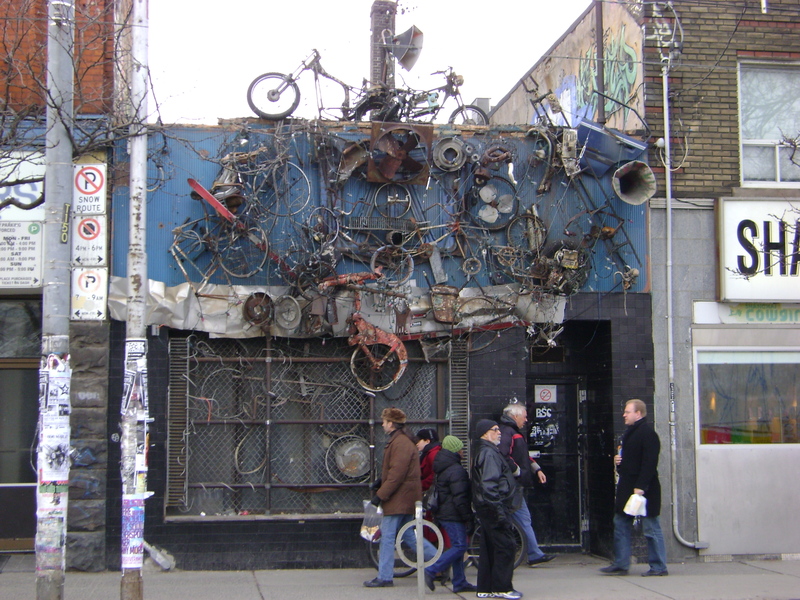 Queen Street West– Landmarks are the City TV Building with its truck-crashing-wall aesthetic and Speaker’s Corner, a video recorded outlet for visitors to “air” their grievances or make social comments, and Muchmusic, Canada’s less polished and more improvisational answer to MTV. Press your face to the glass to glimpse live performances and interviews from big-name or up and coming acts in “the environment.” Ride the streetcar to the Queen West limit, watching the city morph architectural styles block by block. Get off at Landsdowne Avenue, walking north to Pura Vida, where you can try gallo pinto at the only Toronto Costa Rican restaurant. 9. Horseshoe Tavern– A heavy-hitter in Toronto’s live indie-rock scene, “the shoe” hosts free live music nights for new bands Mondays and popular Canadian bands like Matt Mays and el torpedo, Wintersleep, Hey Rosetta! and Spiral Beach on bigger nights. Montreal singer-songwriter Sam Roberts has also rocked the joint. 10. The Beaches Boardwalk– In Toronto’s trendy Beaches neighborhood, take in lake front breezes, volleyball games and the 21st Annual Beaches International Jazz Festival (July 17 – 26). Suntan the afternoon away, or build Inukshuk rock cairns (stone statues) in the sand before exploring the upbeat neighborhood. Stop in for a micro-brew at Castro’s Lounge (2116 Queen Street East). Gallery | This entry was posted in Canada, Travel Writing and tagged Barack Obama, Blue Jays, Brickworks, Caribbean, Castro's Lounge, Chorley Park, Don Valley, Fenway Park, French, Grossman's Tavern, Hey Rosetta!, High Park, Horseshoe Tavern, Jeff Healey, Kensington Market, Matt Mays & el torpedo, Montreal, Moore Park Ravine, MTV, Muchmusic, Multiculturalism, Pura Vida, Rogers Centre, Sam Roberts, Spiral Beach, Toronto, Ward's Island, Wintersleep, Yankee Stadium. Bookmark the permalink. 1 Response to 10 stages a weekend in T.O.